The review summarizes papers related to electrochemical corrosion behavior of mild steel in acidic medium containing newly synthesized green or environmental organic inhibitors. The review covers: electrochemistry, isotherms, immersion time, temperature, and inhibition efficiency. 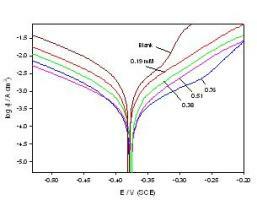 The electrochemical corrosion behavior was investigated using various electrochemical techniques, i.e. open-circuit potential (OCP), potentiodynamic polarization, electrochemical impedance measurements (EIS) and surface examination via scanning electron microscope (SEM) technique.